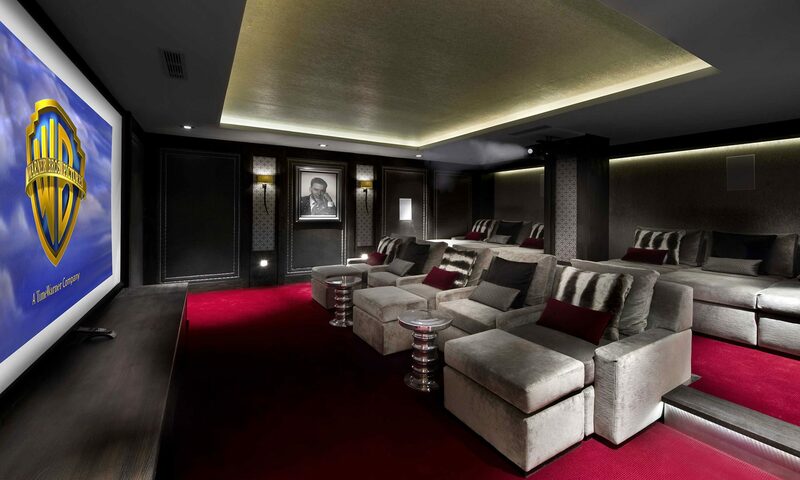 A selection of home cinema rooms commissioned within the scope of larger projects, demonstrating our team’s ability to create luxurious and comfortable cinema spaces that bring the glamour and theatre of the Hollywood era right into the home. Commissioned for a prestigious ski chalet basement, the brief called for us to evoke the mood and atmosphere inspired by the classic grandeur of the ‘Odeon’ theatre style of the 1930s. Luxurious bespoke furnishings set the tone for comfortable evenings in a comfortable environment where chalet guests can enjoy cutting-edge home entertainment! The latest audio visual technology provides film, music and streamed TV. The entertainment areas within this ski chalet are an important feature of the property’s facilities. 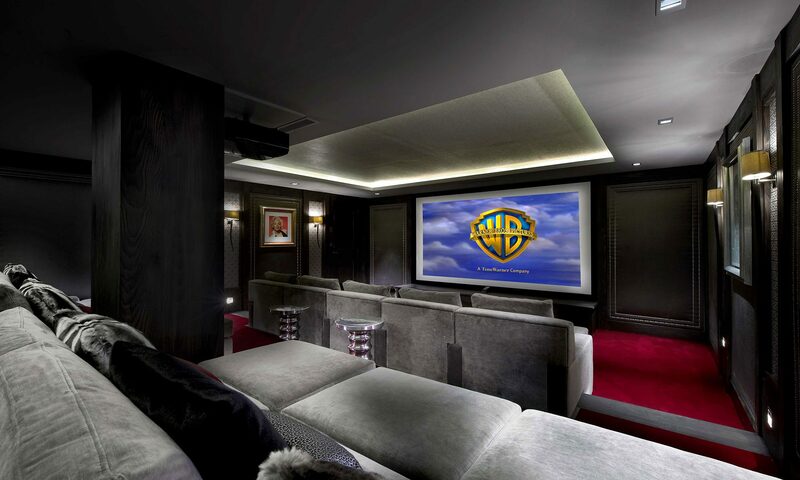 Our client was keen that a home cinema reflecting a Deco theme should express a sense of luxury, refinement and comfort for chalet guests. There is a sense of theatre and a hint of nostalgia about the fluted Deco-inspired wall panelling and the deep, richly upholstered seating. Our team sourced original Hollywood photographic portraits that we framed to suit the mood and finishes of the cinema room. Set within the basement of a new-build extension in a rural location, this home cinema links directly to the client’s wine cellar, which our team designed specifically to integrate both activities – so that evenings might start with a wine tasting in the comfortable banquette seating space at the rear of the cinema, then progress to big-screen entertainment in the comfort of the bespoke upholstered sofas, which are scattered with mosaic-inspired Italian fabric cushions – a direct reference to the custom designed Italian mosaics that adorn the walls of the spa facility on the ground floor of the new-build. Upholstered wall panels and a richly decorated geometric wallcovering define the luxurious space, capturing a mood of cinematic glamour, with portraits from world-renowned photographers creating a sense of classic, effortless style.